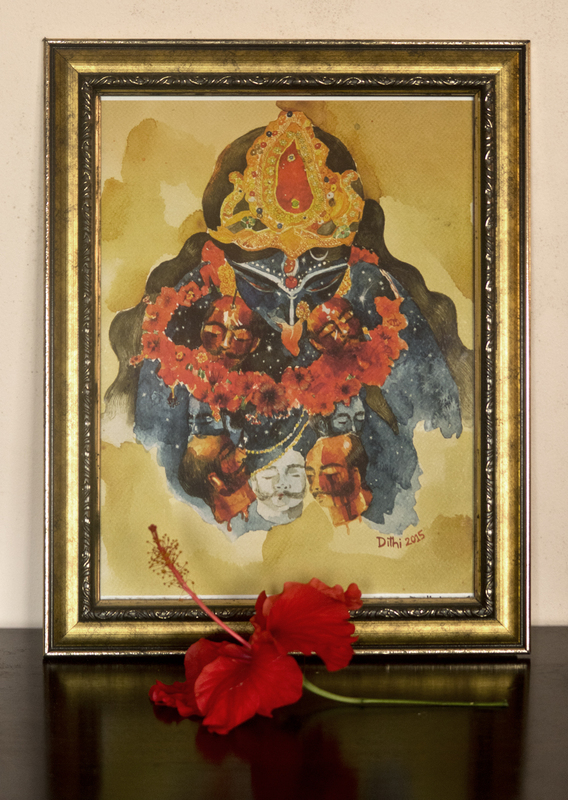 Maa Kali, painting by Dithi Mukherjee. Canvas print available here on Etsy. Colossal, symbol-idol of all-sheltering Nature. In whom throbs the heart of all-protecting, mothering kindness. Thy two dark eyebrows of twilight and night. Clouds of Eternity veil Thy Face. the heat of their own material fire. Thy Body of Activity sweated with restlessness. And implored Thee to send the cooling breeze of peace. The halls of festive prosperity, and the shrines of peaceful wisdom. The dream of new-born planets and earthquakes and partial dissolutions. And all Creation was a furnace of flames. With its body of pure flames. Ushering in the soothing rays of Peace. In whom all Creation rests. tinkling bells of little laughing harmonious lives. cinemas of Cosmic dramas play. And show me Thy delusion-driving Face of Mercy. so wonderful what you are doing Devarshi! What a gift to us all. Thank you!! !